The amphitheater of Pissouri stands strategically on the hill top, modeled on the ancient amphitheater of Curium where gladiators fought beasts for their freedom. It still entertains the crowds today but with less violent methods! Regular events include selections of classical musical performances, ethnic dancing, paneuropean dancing caravans, army bands and plays. In the cobbled square, the heart of the village, free shows of traditional dancing and entertainment take place weekly every Wednesday throughout the summer season (known as Cyprus Night). The newly established and rennovated cultural center of the village accommodating the museum of the area will offer you unique shots of joy and historical memories. It is a historical fact that the abandoned, ruined and destroyed old Police Station by EOKA B' (1973) has malformed into a cultural and historical point of our community. One of the main goals of the current community Board was to transform this old and ruined building into a new, modern construction which will give to the visitor a pleasant first impression, since it is located in the entrance of our community. The continuous negotiations and contact with former Interior Minister Andreas Christou, the community has achieved its goal on renovating the old police station building. The project has been completed and soon the Board will decide on the final use and functionality of the new building based on the uniqueness and diversity of exhibits on all cultural and socioeconomic benefits. ossible in order to drive the attention and interest of the visitors with the aim of obtaining competitive advantage over our surrounding and neighbouring areas where now they have their own cultural centres. The formation of such conditions that allow the visitor to get to know better some of the places of interest such as the Church, Square, Auditorium, Multipurpose Center, will provide the community the ability to attract alternative tourism (conference, exhibition, cultural) replenishing the six-month gap period that our community suffers economically. shall be conducted methodically and systematically. The project will cost around € 2,000,000. 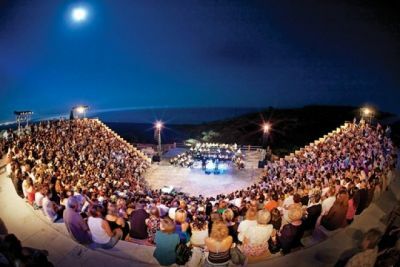 Pissouri Amphitheatre was built in 2000. It has a capacity of 800 seats, perfect acoustics and amazing views across Pissouri towards the sea, Akrotiri and Limassol. It is located at the heart of Pissouri village, just a short walk from local bars and taverns. It is the perfect venue for outdoor summer events. A great range of events and festivities are hosted in this venue every year which are organised from all the organised groups of pissouri as well as other groups across the island and the world.